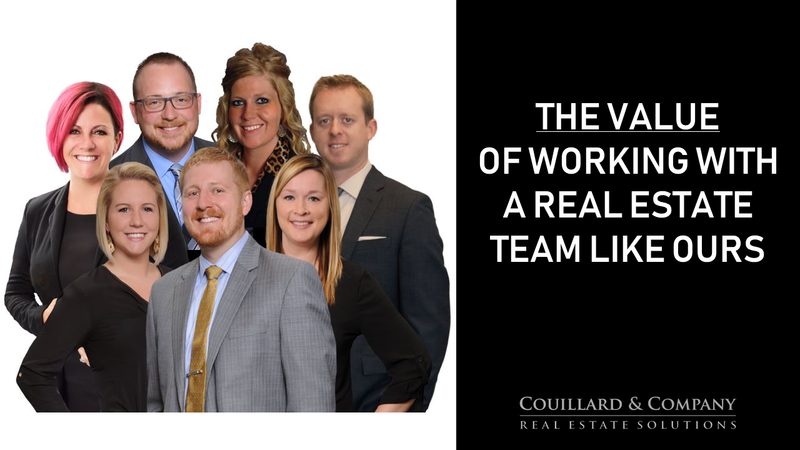 Value of working with a Real Estate TEAM like ours - by Couillard & Co.
Value of working with a Real Estate TEAM like ours! Seth is the LISTING specialist for our team. It’s what he does, what he knows and he’s really good at it. A full team of agents (4) that specialize in Buyers. They know what buyers need, what to look for, what inspections they need, what repairs are necessary (and unnecessary). With that, they can keep you calm during that inspection process because it’s what they do on the daily. They’re very intentional about keeping that time calm and organized. All while being the bulldog agent you need to get things done and fixed when, by contract, they should be! That’s some serious value! A listing manager that specializes in the right conversations for helping you sell. She sends you feedback from agents that show your house and helps you evaluate if you need to reduce your price or make some kind of conditional change to get you sold faster. She’s specifically here to SELL YOUR HOME FASTER because when you get feedback and you don’t do anything with that, you’ll just sit there on the market waiting. A transaction manager that dives deep into your transaction pending to close. She’s YOUR personal assistant during that time – ordering inspections, helping with invoices, making sure all your paperwork is signed, signed correctly, and delivered to those who need it, and in control setting your closing so all you need to do is literally show up and buy the house!! A Operations Manager that oversees every system and person in the business!! This ensures everything we promise you gets done. When you work with a team, you get flexibility. Say you’re working with Ashley and she goes out of town… Luckily, we have 4 other agents and one licensed admin that can step in and help show houses or write offers. You’ll never be left hanging if your agent is unavailable. We’re a team and we act as one. Value of availability can be crucial when making an offer first when there are more coming! Being the #1 training company in the world (across all categories), value of education is huge here. We’re constantly involving our team in new training’s in our office and region. We’re bettering each other every day by engaging in role play and script practicing. Now I know when you hear “script” it doesn’t sound genuine. To us, it helps us know how to handle each situation in the best way possible – ways that are proven to work. For example, practicing a script for negotiating a deal – wouldn’t you want an agent that knows the right words and phrases to help you get the best deal possible? And how about when you’re maybe having a moment of panic about something? We’re trained in how to walk you back into reality, so you can make a confident and informed decision. Having a concerned, objective 3rd party helps you stay focused on the issues most important to you. Then add a group of 7 people together with experience ranging from 1 to 12 years, we can talk as a group to help solve any issue – it’s very likely someone has experienced it before! We also have all lived in this area our whole lives. We know this market and study it daily as a team. We’ll get you the most accurate listing and negotiating sale prices! As a group of 7, we all have our own personal connections with various vendors. We’ll find a solution to every Real Estate need you have! (Hence the team name 😊) Painter, electrician, cleaners, window replacement, remodeling, contractors, carpet installers, etc. We’ve got names! We’ll be sure to set you up with only trustworthy and successful contacts. Interested in working with our team? Go to our Contact Us page here and fill out the form!